The Katy Depot and other artwork by artist G. Harvey can be viewed in our artist slideshow. 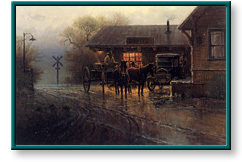 The Katy Depot by artist G. Harvey and other Gerald Harvey art, art work, artwork, canvases, giclees, images, limited editions, open editions, paintings, paper, pictures, posters, and prints can all be found at Christ-Centered Art. The Katy Depot was constructed in 1898 and served the Missouri - Kansas - Texas Railroad Company (also known as the Katy Railroad) until 1957. The depot served as a water stop for steam engines of the era and was a key reason many settlers came to Texas. In 1979, the depot was moved to Katy City Park and has since been used as a railroad museum. In this painting, G. Harvey encapsulates a bygone era when The Katy Depot was bustling with travelers anticipating the arrival of a train. Image Size 14.5" x 21.75"
The Katy Depot by artist G. Harvey as well as other open and limited edition cityscape, Civil War, Focus on the Family, oil industry, rural, and western paper art prints and canvases, giclees, images, lithographs, paintings, pictures, posters, and reproductions by renowned Somerset Fine Art and Somerset House Publishing artist G. Harvey can be viewed and purchased at special sale prices at Christ-Centered Art.